Visiting Australia was a dream come true. Not only one dream, but many. Like bumping into kangaroos and koalas in the wild. Diving at the Great Barrier Reef. Or hugging a koala. 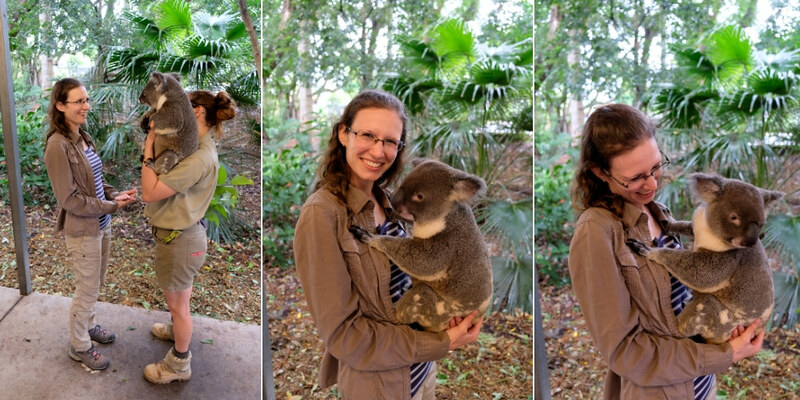 Hugging a koala, you guys! I can still hardly believe it happened. But I definitely have a picture of myself, grinning with this fluffy cuteness in my hands. Csaba, too. So where can you hug a koala? Actually, it’s not that easy to encounter koalas in Australia as you’d think. They inhabit only the southeastern and eastern part of the continent – the states of Queensland, New South Wales, South Australia and Victoria. And since they spend most of their lives in the high gum trees, they’re not that easy to spot. We’ve actually seen koalas in the wild only once – in Great Otway National Park. And that was not the place where we hugged them. You shouldn’t either. Wild animals are like their name says: wild. It’s for their sake and yours that you keep it that way. So definitely no touching or feeding. The places where you can touch (and hug, yesss!) koalas are the zoos and sanctuaries. 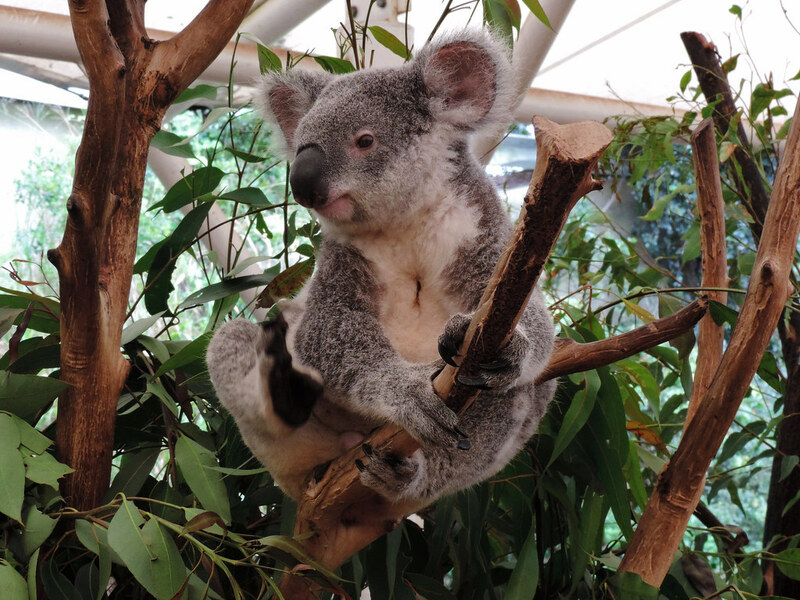 Those koalas are used to humans, the interaction with them is safe and closely monitored by the staff. Also, you can learn a lot about them! 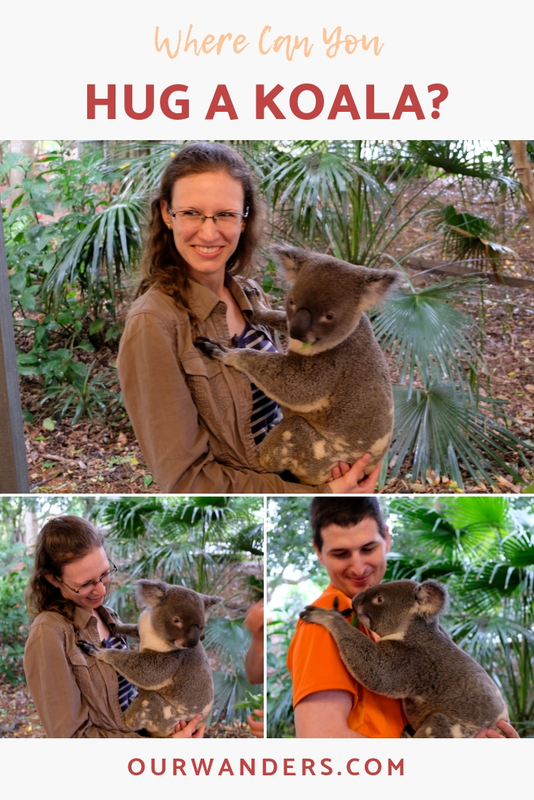 We visited Lone Pine Koala Sanctuary in Brisbane, and we ended up spending most of our day there. That’s what happens when you finally find those incredibly cute koalas. This sanctuary turned out to be a great place for several reasons. First, of course, koalas. 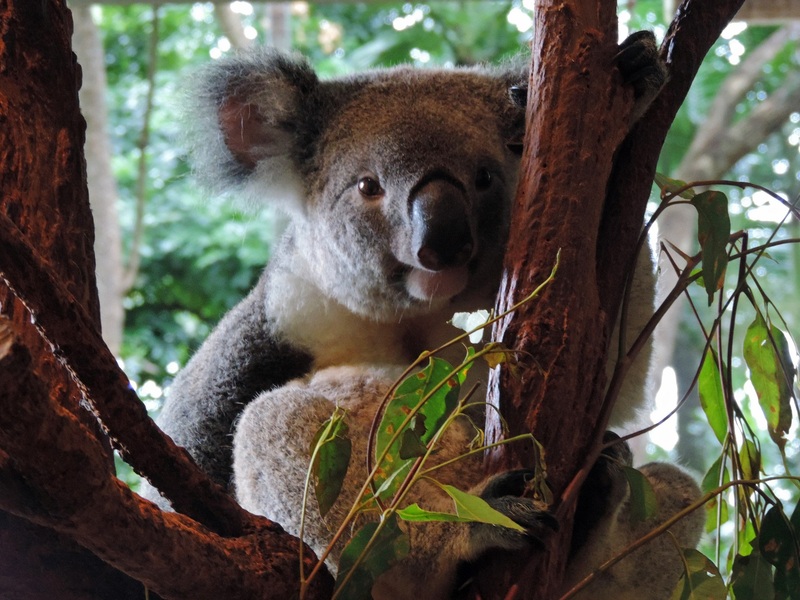 Second, unlike its name suggests, there are not only koalas in the sanctuary, but we could see most of the strange and cute Australian creatures. 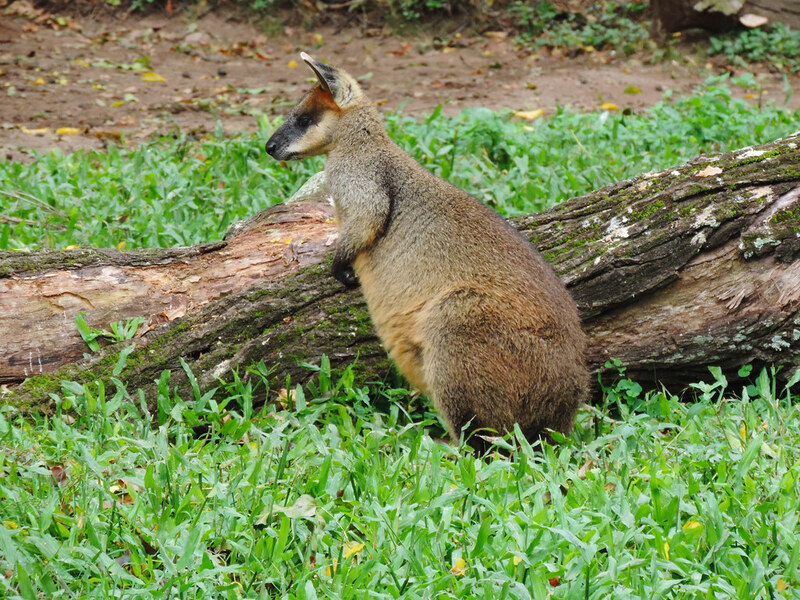 Like wombats, anteaters, tasmanian devils – just to name the cutest ones. We’ve also seen a platypus the first time in our lives there! It’s much smaller than we imagined, and it didn’t stay still not even for a second. 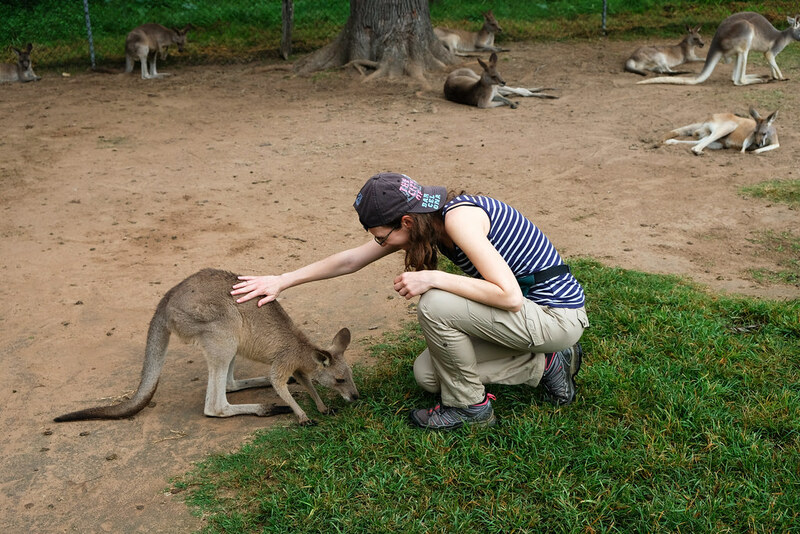 Last but not least, there’s a HUGE area where visitors can pet kangaroos. (What? I’ll never leave this place!) There’s proper food that you can buy to feed them, too, but unless you arrive early enough, there’s a high chance they won’t be that interested in it. All the kangaroos who have enough of humans can go and have a rest in a protected area where visitors are not allowed. Koalas are lonely creatures. We found the adult males usually alone, but the females and joeys together. A lot of them were sleeping – koalas sleep a lot! Like 16-22 hours a day. Luckily, the naughty little joeys often wake others up as they move around in search of the most delicious eucalyptus leaves. Needles to mention, we found them incredibly adorable whatever they’ve done. As we learned, koalas are actually quite fussy about what they eat. They select the most nutritious and tastiest leaves, and each of them have their personal favorites. 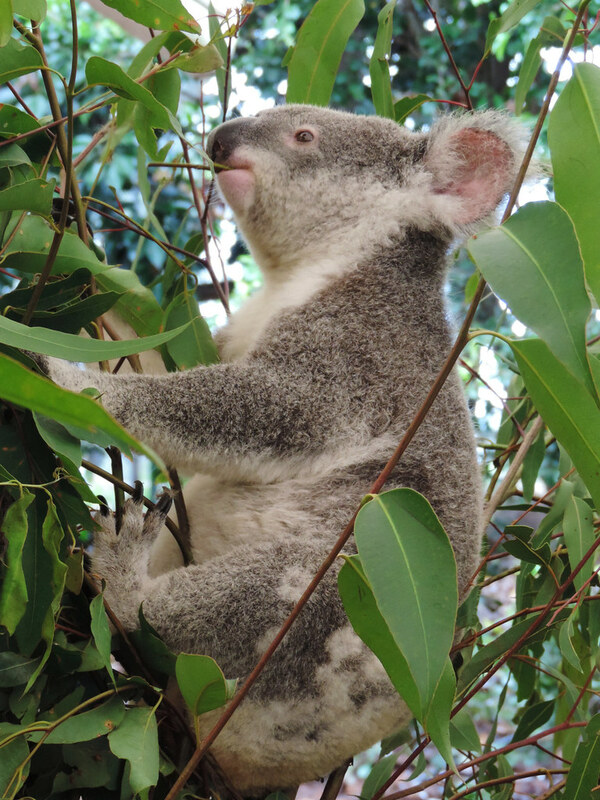 On the other hand, they rarely drink water, because they get almost all their moisture from the eucalyptus leaves. By the way, did you know that eucalyptus leaves are poisonous? No one else can eat it, but koalas have a special digestive organ that allow them to break it down unharmed. If you want to hug them, you need to buy a separate photo ticket in addition to your entrance ticket. We bought two tickets, one for me and one for Csaba, so that both of us can hold them. 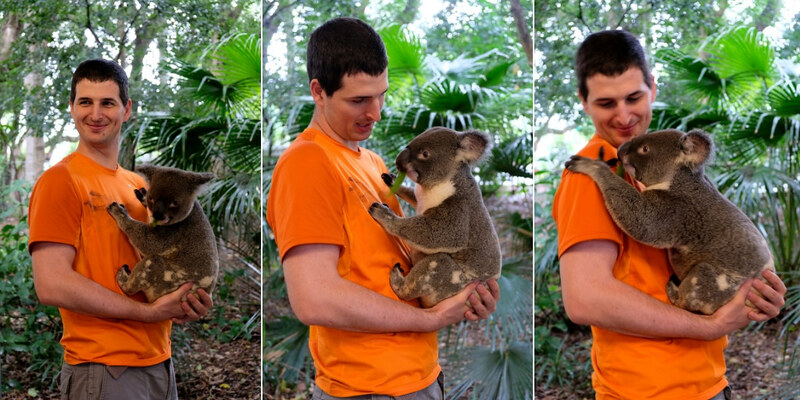 The ticket is actually for taking a picture with a koala in your hand. But that means you will have a koala in your hand! After the staff showed us how to hold him, we had him all to ourselves for about a couple of minutes. It doesn’t sound like a long time, and it’s not. Those photos were taken too fast. But he was so soft and cuddly – and surprisingly heavy. Even that few minutes (that seemed like seconds) was enough for me to fell head over heels for my new friend. In the meantime, he was patiently chewing on eucalyptus leaves, clearly not that interested in me as I was in him. I guess it’s because he doesn’t waste energy on anything other than eating. Clearly not because the lack of my admiration. 😛 But considering that koalas eat up to one kilogram of eucalyptus leaves in a single day, no wonder, he was so busy. We were also told that once a koala gets tired of humans, they let it rest and get another one. So we felt that we do no harm to them, but take a memory that will surely last for a lifetime. So what’s the cutest creature you’ve ever cuddled? Disclosure: Our visit to Lone Pine Koala Sanctuary was not sponsored. As usual, all opinions are our own.